Before the new diet or exercise plan begins, a change of mindset may be in order. Constantly telling ourselves that we are fat, even when we are not or are just a few pounds overweight, can actually make us more likely to become overweight later in life. For many people, “fat talk” is not actually about “being fat” but rather about “feeling fat.” Fat thoughts and harsh self-judgment can cause psychological stress, which can have long term effects on weight. If you need to lose weight and get in shape for your own health and wellness, start “thinking thin,” as how we perceive ourselves can affect our actual weight gain or loss. 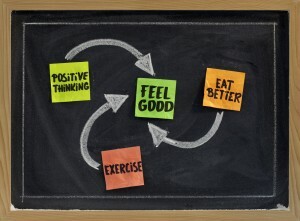 Instead of negative self-talk, focus on creating a healthy, physically active lifestyle. Finding enjoyment in healthy behaviors can help you change your mindset and stick to your goals. If there is a certain kind of ethnic or international food you enjoy, such as Thai or French food, buy a new cookbook and get inspired to eat healthier by trying out new recipes. Be adventurous; cooking can be an enjoyable activity. When you are making quality food yourself, you know exactly what it doesn’t contain — hidden sugars, processed fats or unhealthy artificial ingredients. Regular exercisers report better sleep, increased energy and a happier outlook. Once you’ve established a regular exercise routine, you’ll find you won’t want to skip a day of exercising because it makes you feel great — getting fit becomes the side benefit. If you’re sitting at a desk all day, stand and stretch every hour to boost your metabolism and increase calorie burn. Meal planning helps to keep you from making unhealthy last minute food choices. When you are heading home at the end of the day and you have no plans for dinner, it’s tempting to zip through the fast food line. Make extra food when you do cook and refrigerate or freeze in portion sized meals for later in the week when you may be stressed for time. Make a big salad on the weekend and have it for lunch during the week. Creating your own small bags filled with healthy snacks such as unflavored nuts, fresh or dried fruit, or raw vegetables helps to rein in the temptation to grab a bag of chips and fill up on empty calorie junk foods. Make the switch from that snack sized 100 calorie bag of cookies to a piece of fresh fruit or a low-fat yogurt. Grocery shopping with a list and a time limit may help you save money and avoid all those processed food aisles. Research has shown that paying with cash instead of a debit or credit card leads to buying significantly less unhealthy, calorie dense foods and helps avoid impulse buys. Skipping the processed food aisles altogether helps you to avoid high sodium foods, empty calories and added sugars while helping to cut down on your total grocery bill. Purge your pantry. When you clean out your store of unhealthy foods and replace them with healthier ones, you’ll make better choices automatically. This single exercise can help you slim down by simply making the switch from nutritionally-empty, high-calorie foods to nutritious snacks such as whole grain pita chips with guacamole or carrot sticks with hummus. Avoid nighttime eating 5 nights of the week. Most of our mindless after dinner munching consists of sweet or salty junk food. Decide what time of night works best for your schedule but eat dinner at least 3 hours before bed and don’t eat again until morning. When we practice the 80/20 rule in which we eat healthy foods 80% of the time, we can still lose weight and can guiltlessly enjoy those occasional favorite sweet indulgences on weekends. So with 2014 here, be mindful of your health, nourish your body and enjoy your active life. It may take time to change your mindset and eliminate unhealthy thoughts and habits, but the rewards are boundless. As you take this new approach, remember the ultimate goal is not unrealistic and quickly forgotten resolutions but rather a continuing quest for a healthier lifestyle resulting in better overall health and fitness. Happy New You! This entry was posted in Home and tagged diet, positive thinking, weight loss. Bookmark the permalink.